James Harris — UCSC Farm and Garden alum, Army veteran, now financial advisor at the USDA — talks about swapping spades for spreadsheets. James Harris, a UCSC Farm and Garden alum and Army veteran is now a financial advisor at the USDA. Photos by Melissa De Witte. Harris recently spoke to apprentices at the Center for Agroecology and Sustainable Food Systems. When you imagine a small farm in rural California, things like crop yield ratios, deductible farm expenses, or net operating losses probably aren’t the first things that come to mind. 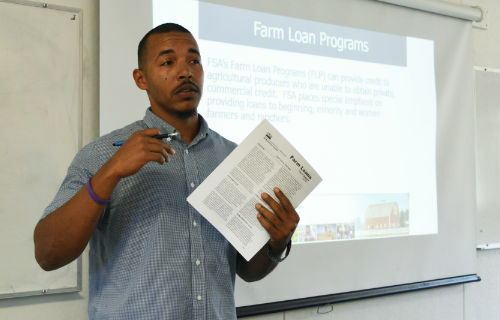 Such topics are seldom the focus of attention for many of the farmers that UCSC Farm & Garden alum James Harris meets with as their loan advisor for the United States Department of Agriculture (USDA). Harris, who graduated from the Center of Agroecology and Sustainable Food Systems’ (CASFS)’s prestigious ecological horticultural apprenticeship program in 2015, now works for the Farm Services Agency (FSA), a USDA organization that help farmers deal with desperate times through low-interest farm loans, grant programs, disaster relief assistance, and credit counseling. As a former farmhand and apprentice, Harris understands the unique challenges farmers face, especially those running small and medium-sized operations. He knows that financial details often take a back seat to managing day-to-day farm operations, such as purchasing seeds and fertilizers, understanding water management and irrigation, fixing operating equipment, plus all the sales and marketing. When farmers come to the FSA, they’ve exhausted all other lines of credit. They’re often carrying other debt obligations and some are close to bankruptcy. No commercial bank will touch them, says Harris. “We’re their last hope,” he says. Farming means a lot to Harris. Perhaps more than to most people. Before Harris turned to a career in agriculture, he served in the U.S. Army where he did two tours of duty in Iraq. He survived multiple attacks from enemy combatants, including blasts from IEDs. Readjusting to civilian life was difficult. In the wake of the violence he faced, Harris battled depression and post-traumatic stress disorder. It was through farming that he found hope and healing. 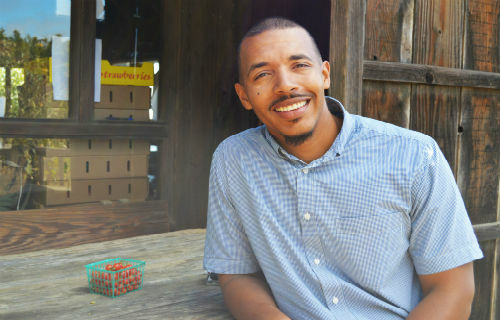 The Farmer Veteran Coalition (FVC), a nonprofit group with Santa Cruz roots, connected Harris to the apprenticeship program at CASFS, where he spent six months immersed in learning the ins and outs of organic farming and gardening. And the FVC support did not end there. They asked Harris to share his story at their annual conference. In attendance was then California State Executive Director of the FSA Oscar Gonzales, who was inspired by Harris’s story of survival, perseverance, and gratitude and encouraged him to apply for a job with the agency. A few months later, Harris moved to “hot, hot Fresno,” where he has been working for the FSA ever since. Harris’s military background also turned him into a planner. Every military mission has a strategy: goals are established, objectives are defined, and resources are carefully managed. Time, scope, and cost are laid out. Once a plan is in play, detailed logs are kept. Information is tracked and trends are forecast. Harris approaches farm management in a similar way. For Harris, creating an operations plan is more than just making sure farmers can meet their fiduciary obligations. It’s about helping them transform their struggling farm into an economically sustainable business. “Farming is not like other businesses where cash flow is constant. In farming, cash flow is more episodic,” says CASFS director Daniel Press about agriculture’s unique economic structure. CASFS makes significant efforts to address the importance of understanding the business of agriculture with growers, says Press. The center has recently published a second edition of Teaching Direct Marketing and Small Farm Viability, a robust manual that provides resources for teaching a variety of skills and topics related to small farm viability, including direct marketing opportunities, business planning, issues related to labor, apprenticeships, food safety, and land tenure options. Harris credits his interest in business administration to his experience as an apprentice at CASFS. “The Farm and Garden Market Cart was everything!” recalls Harris about the seasonal pop up farmstand that farm apprentices operate at the base of the UC Santa Cruz campus. “Before cart opened, we would weigh how much produce we had at the beginning of the day. At the end of the day we would weigh what was left. From that, we’d then know how many pounds of produce we sold,” says Harris. From operating the UCSC farm cart, Harris realized how vital record-keeping was to farm operations. “From the cart calculations, we could also tell what was in demand and what wasn’t,” remembers Harris. “I would geek out over this stuff,” Harris recalls. He would pour over the sales figures late at night to calculate trends and understand supply and demand. “Some farmers I work with don’t even think about doing that. They go to the farmer’s market and have no idea how many pounds of produce they sell,” says Harris. Many people - whether they are a farmer or not - encounter a mental block when it comes to math. “Financial illiteracy is a major issue in the community I interact with,” Harris adds. Indeed, financial illiteracy is not unique to farming. According to one study, nearly two thirds of Americans cannot pass a test that asked basic financial knowledge that impacts their everyday lives. Harris hopes to change that trend. He is taking his passion for business administration even further. Harris recently started a part-time MBA program at California State University, Fresno where he hopes to develop his skill set to further serve agricultural clients. What does Harris hope for the future? “I want to help make people’s dream come true,” he says.